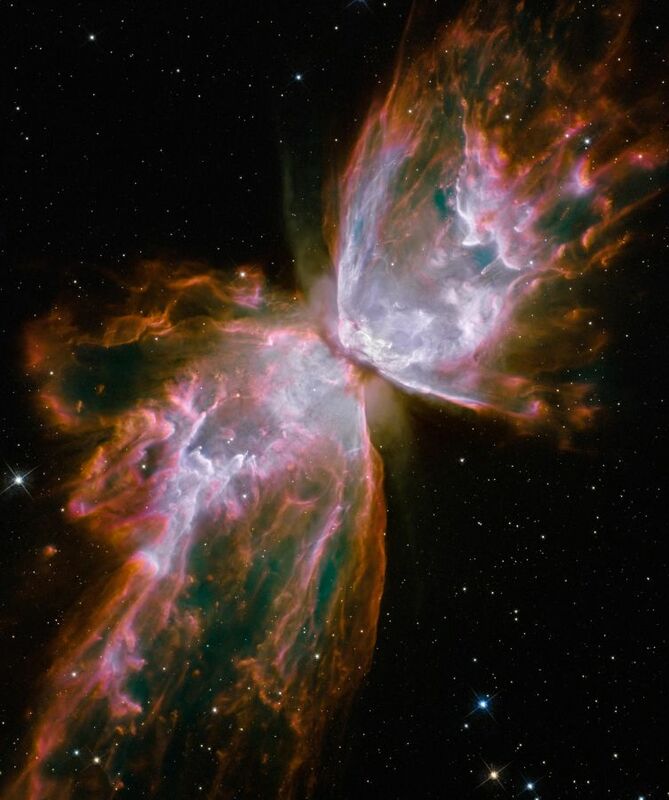 What a beautiful image of the Butterfly Nebula. This planetary nebula is a result of a dying star that was 5 times the mass of our own Sun and released a fury of hot gasses and a stream of ultraviolet radiation. For those of you who don’t know it’s called a planetary nebula because when viewed through a telescope it appears to look like a planet. In the 1780’s William Herschel coined the term planetary nebula even though it is a misnomer, astronomers still use the term today. The gas you see in the image is ripping through space at 965,606 km an hour (600,000 miles an hour), fast enough to travel from the Earth to the Moon in 24 minutes! If you wanted to take a trip to the Butterfly Nebula or also known as the Bug Nebula it would take you about 2,200 years travelling at the speed of light. The Butterfly Nebula measures about 2 light years across which is about 20 trillion km! The central star is actually there but it’s hard to see because it’s covered by an envelope of dust and gas that constructs the “hour glass” shape. The star’s surface temperature is a scorching 222,204 C or 400,000 F making it one of the hottest stars in our galaxy. To give you a little perspective our Sun’s surface temperature is about 5,526 C or 9,980 F. So you can see how much of a difference that is and just imagine the hottest day you’ve ever had and then multiply that by 40. The evolution of the star is quite interesting. It started off evolving into a red-giant star that was 1000 times bigger than our own Sun. It started to shed off its layers and sending gas flying at about 32,186 km per hour (20,000 miles per hour), creating a doughnut-shape ring. At the same time other gasses were being ejected perpendicular to the ring at higher speeds. Later, something incredibly happens. The central star stars to heat up intensely and a much faster stellar wind, a stream of charged particles, travelling at 3,218,688 km per hour (2 million miles per hour)! This event helped shaped the nebula even more and plowed through the wing-shaped structure. Looking at the edges of the butterfly marks the coolest areas of the nebula, which are made up of nitrogen. The white color in the image is sulfur gas, it’s also a region where the fast-moving gas overtakes and collides with the slow moving gas, producing these wonderful shock waves. This image of NGC 6302 was taken on July 27, 2009 with Hubble’s Wide Field Camera 3 in ultraviolet and visible light.